Lauren Sindt was elected to the the position of Director of Hospitality Division in 2018. Prior to the Spring of 2012, she felt mostly like a geek all alone in the universe. She was connected to and involved in the world, but was not rooted to any place, people, or concepts. 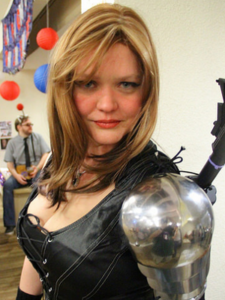 Through a series of fortuitous events and the kindness shown by then strangers who have now become some of her closest friends, she was introduced to the geek community in the Twin Cities, and attended her first CONvergence that July. It was life changing. The existence of CONvergence membership, and connection to the overarching local community is very significant to her past, present, and future. The experience she had is not uncommon, many before have felt the benefits and many more shall need them in the future. This is why she wishes to become a greater part of making CONvergence a reality every year, and to make it an inviting inclusive haven for nerds, misfits, and weirdos of every sort. Lauren first volunteered in 2013, was brought in as a Sub-Head in CONvergence Operations in 2014, and was made a Co-Head of Operations part way through the 2015 cycle. She had continued in that position through the 2016, 2017, and 2018 cycles. Her major initiatives in this role have included spearheading the revision of the convention harassment policy and development of the member code of conduct, developing the training and procedures to consistently and effectively implement member conduct policies, revision and clarification of the CONvergence Safe Space initiative. In addition, she made significant efforts to recraft the public perception of the CONvergence Operations department held by the membership and members of the ConCom, and a broad pilot program to develop training and mentorship opportunities for new members of convention leadership. In her role as a Co-Head of Operations, Lauren has worked with many people in many different departments on numerous projects, and has come to appreciate the value of integrated initiatives. She was also the primary coordinator for JofShop, a monthly seminar for local con-runners to collaborate with each other and to learn best practices and takeaways from past experiences. Working to enhance and further develop initiatives to make CONvergence a space of inclusion, a haven and place of belonging for all of the people still looking for their tribe, and a place where all people who have an interest in sci-fi and fantasy feel welcome and included, in spite or, more importantly, because of their specific identity attributes, are among Lauren’s goals. She looks forward to the opportunity to work with each and every one of the ConCom in the coming years.